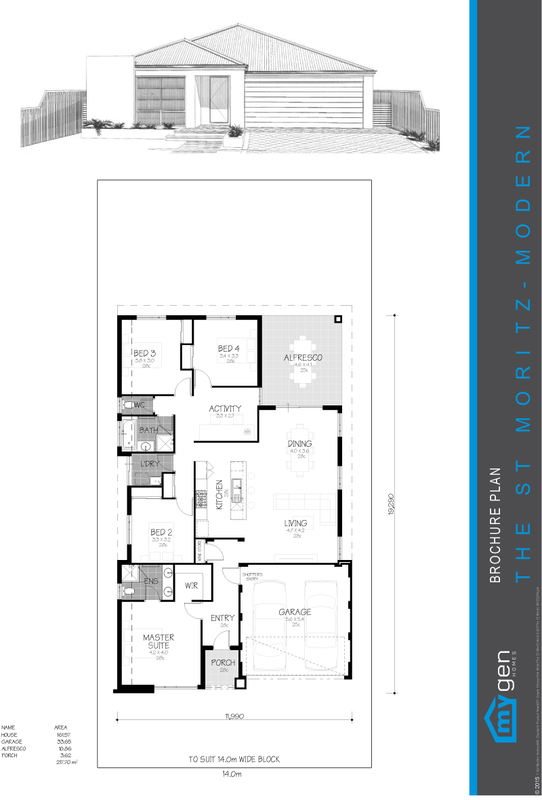 The St Moritz, a 4 bedroom home, offers an impressive master suite, complete with a wine store and an activity room providing entertainment for the big and the small. Please Note: No allowance is made for site related costs (earthworks, retaining walls, storm water disposal) and also for underground power run-in, telecommunications and phone line run-ins or the crossover – provisional sum allowances will be included for all items as required. Please note: No allowance is made for internal wall painting, light fittings, decorator items, general floor coverings, window treatments, air conditioning, fencing, security system and landscaping, unless otherwise noted. Please Note: No allowance is made for any site related costs (e.g. earthworks, retaining walls, storm water disposal etc) nor for underground power run-in, telecommunications and phone line run-ins or the crossover – provisional sum allowances will be included for all items as required. Or you can request more information (or a callback at a specific time).